The most eye catching reveal was the new iMac with Retina Display. The display features a huge 5120 x 2880 resolution that packs in 14.7 million pixels, which Apple is referring to as '5K'. 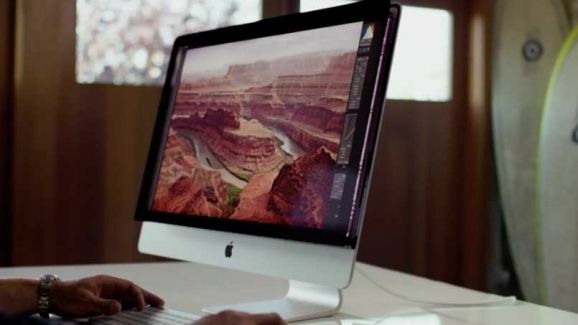 If 4K just isn't enough for you, Apple hopes that the 5K resolution of the new iMac will tempt you instead. It means you can view and edit 4K video full size whilst leaving room on the display for tools and apps. Launched 30 years after the first Mac, Apple has crammed some impressive components into the new iMac, with a choice of a 3.5Ghz Intel Core i5 or 4GHz Intel Core i7 processor, 8GB of RAM as standard and an AMD Radeon R9 M290X graphics card to handle the ultra high resolution. It's shipping today with a base price of $2499. Whilst this is still a high price tag, Apple hopes that people will look at the prices of 4K TVs and decide to go with the more versatile iMac. The Mac Mini also got an outing today with some updated features and a new more wallet-friendly price. It now comes with fourth generation Intel Core processors that excel at graphics performance. Wireless AC Wi-Fi and two Thunderbolt 2 ports are also included. The standard model features a 1.4 GHz dual-core Intel Core i5 processor, 4GB of memory and a 500GB hard drive starting at a suggested retail price of $499, which is $100 cheaper than the previous version. Like the new iMac, the Mac Mini starts shipping today. These new products will be able to interact each other as well as the iPad Air 2 and iPhone 6 thanks to Apple's latest operating system, the mobile iOS 8 and OSX Yosemite, which Apple announced would be available today for absolutely free. Getting Apple's devices to work seamlessly together has been a focus for Apple, such as using Airplay to stream media from an iPhone to an Apple TV without needing to connect to Wi-Fi, or sending and receiving texts or phonecalls from any Apple device. Along with the announcement that OSX Yosemite will be launched today for free, the iOS 8.1 update will be available for free from October 20.